The Far East Street exhibition has officially opened at the 4th Eastern Economic Forum. The opening was attended by Deputy Prime Minister of the Russian Federation and Presidential Plenipotentiary Envoy to the Far Eastern Federal District Yury Trutnev, Minister for the Development of the Russian Far East Alexander Kozlov, Far Eastern governors, and representatives of the federal and regional authorities, business, and the public. “The 4th Eastern Economic Forum will kick off very soon. But today we are opening the Far East Street for the fourth time. Like many other aspects of the Forum, the Far East Street exhibition is unique. The 1,300-metre embankment presents nine constituent entities of the Russian Federation that cover an area of more than 6 million square kilometres, or 36 percent of our great country of Russia. Culture and customs, natural features, investment projects, and different areas of regional development are all represented here. 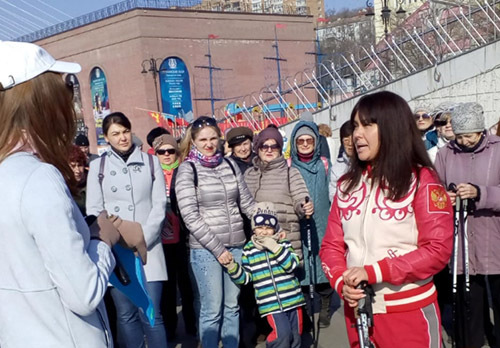 Most importantly, though, you can feel the people’s love for the land on which they live”, Trutnev said. The Far East Street exhibition is one of the key events of the EEF 2018 programme, as it presents the economic potential, cultural traditions, and tourism opportunities of the Russian Far East. All the regions of the Far East have set up their own expositions. A flyover of the Su-35S fourth generation aircraft took place as part of the opening ceremony. “The Russian Far East is an enormous territory. When people come here to the forum, there is probably no other way to visually introduce them to all the Far Eastern regions and show off their nature, culture, and economy. The goal of the exhibition is to generate interest in the Russian Far East”, Trutnev said. Trutnev said more and more participants and guests are attending the Eastern Economic Forum each year. “This all goes to show that the Far East is interesting and that there is demand for the preferences and forms of support provided by the Russian government. People will stop somewhere at the exhibition as they become interested in a certain pavilion, which means that they want to come and get to know this region better. This is the goal we are trying to achieve with the exhibition”, he said. “The regions take an unconventional approach to the exhibition. Everyone is trying to show off the most interesting highlights, and this is not easy. After all, each region of the Far East is unique and is not limited to two or three landmarks or a couple of proposals on its investment appeal. Each guest of the exhibition will be able to assess how well this goal has been accomplished. I am certain that after visiting the expositions there will be even more people who want to come to the regions of the Far East as a tourist or investor”, Minister for the Development of the Russian Far East Alexander Kozlov said. This year, the Amur Region came up with the idea of having its exposition resemble a data centre along with the construction of a skating rink with artificial ice nearby. The Sakhalin Region’s exposition consists of a bridge with a high-speed train model. The Arctic regions of Yakutia and Chukotka have very vivid pavilions. Yakutia’s ‘Permafrost Treasury’ pavilion features diamonds, frost, northern lights and a mammoth that has been brought back to life thanks to digital technologies. Chukotka’s exposition at the Far East Street exhibition has total area of more than 900 square metres. At the centre of the ‘World of Real People’ exposition is a six-metre cube that symbolizes the ice cover in the district. The interior space of the cube consists of a large 270-degree projection room that allows people to travel throughout the region. The Khabarovsk Territory’s pavilion is designed in the form of an airplane that is getting ready for takeoff. The territory is home to the Komsomolsk-on-Amur Aircraft Plant, which produces some of the world’s newest domestic aircraft. The exhibition pavilion has a unique interactive exhibit called ‘Window to the Khabarovsk Territory’. Modern multimedia technologies will enable EEF guests to travel around the region and have a peek at the aircraft manufacturing workshop, take a stroll through Khabarovsk, visit the Shantar Islands, and see the petroglyphs of Sikachi-Alyan, the Amur Bridge, and other unique sites in the territory. The Primorye Territory will present existing projects and production facilities as well as future projects in shipbuilding, tourism, fishing, and mariculture. The theme of the region’s pavilion is ‘Building in Primorye’. Kamchatka’s exposition consists of four round orange pavilions that symbolize fish eggs. The three pavilions, which are also designed as round fish eggs, are divided by theme: ‘Nature. The Kronotsky Nature Reserve’, ‘Tourism’, and ‘Culture’. The main pavilion features a 360-degree LED panoramic screen that displays views from Kamchatka, making it possible for visitors to experience the effect of actually being on the peninsula. The Magadan Region pavilion features a mock-up of a gold recovery plant located at the Natalka gold deposit, one of the largest such deposits in the world. The Jewish Autonomous Region’s pavilion allows visitors to read quotes from sacred texts, philosophical treatises, parables, and statements made by prominent individuals. The conceptual idea for the pavilion’s design this year is Jewish wisdom that has been passed down through the centuries. The Far East Street exhibition will be open to EEF guests and participants on 11–13 September. A ‘Social Day’ will be held on 14 September during which excursions will be organized to the exhibition for the disabled, retirees, families with multiple children, and a number of other categories of citizens. On 15–16 September, the Far East Street exhibition will be open to all comers. Last year more than 50,000 guests and residents of Vladivostok visited the exhibition.